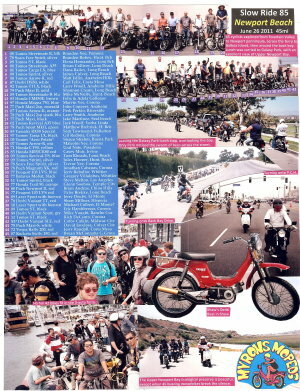 Ride 87 was Sunday August 14, 2011. 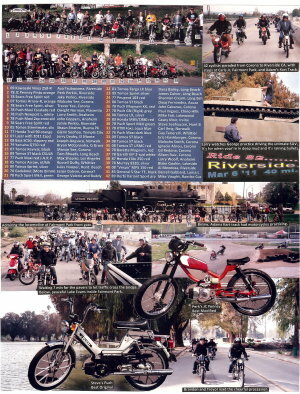 About 27 riders attended. 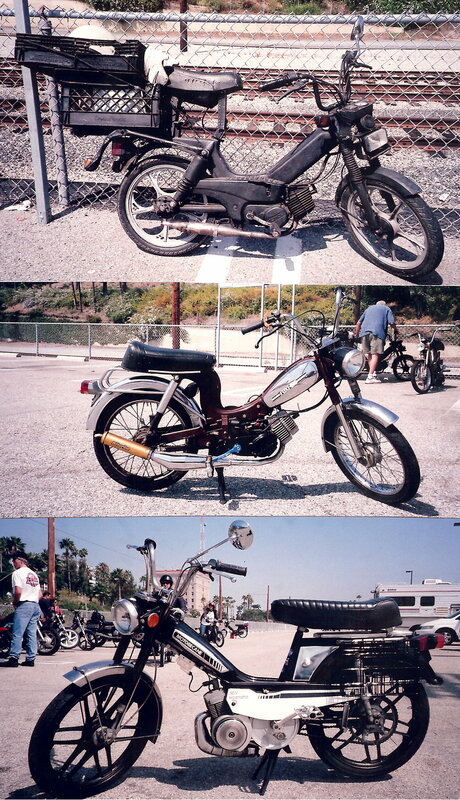 The ride met in San Pedro at the Ports O’Call parking lot. The ride was scheduled to go around Palos Verdes. But the group was advised of a LA Sheriffs Department motorcycle safety enforcement operation in effect for the streets we were heading for. 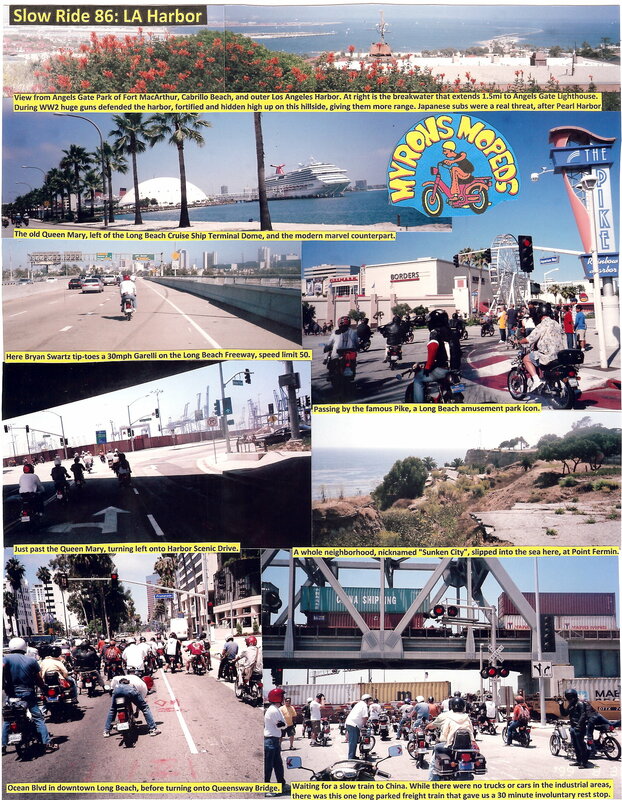 After a lot of discussion and voting they decided to change the route and go to Redondo Beach Pier instead. Some people were relieved, and others were disappointed. But the tribe had spoken. 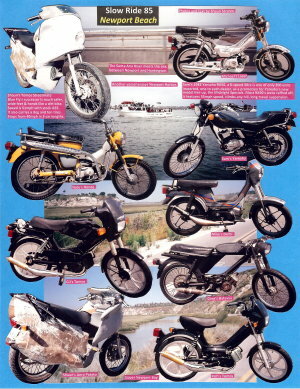 Left top, John’s 02 Tomos – Big Nicks Pizza delivery bike. Left middle, Bryan’s “Tomoxi” Sparta Foxi with Tomos A35 motor. 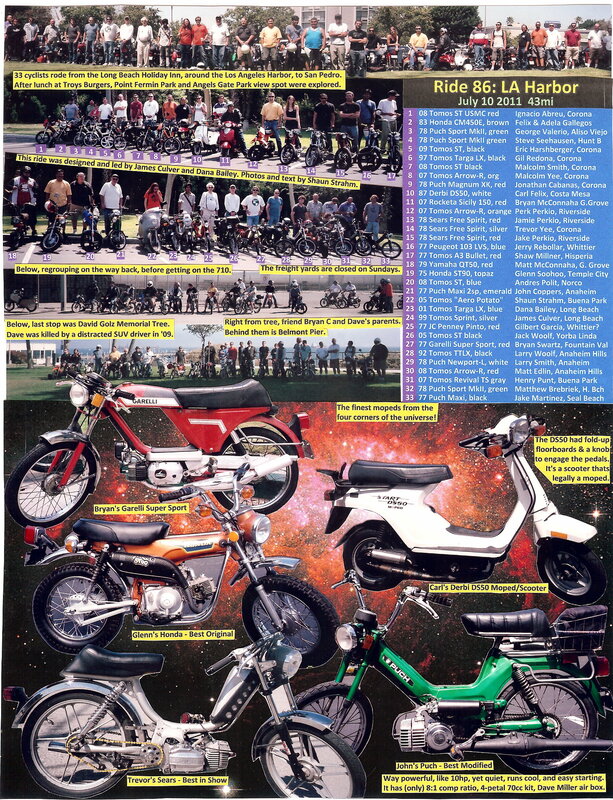 Left bottom, Kyle’s sweet 1979 Motobecane 50VLA (Variator, Long seat, Aluminum wheels), Best in Show. Click to enlarge. Wooly Bully Chris rests on the orange Motobecane. Road cyclist Bryan splits the air on the red Tomos Streetmate R. Technology wizard James skillfully operates his silver Tomos A35. 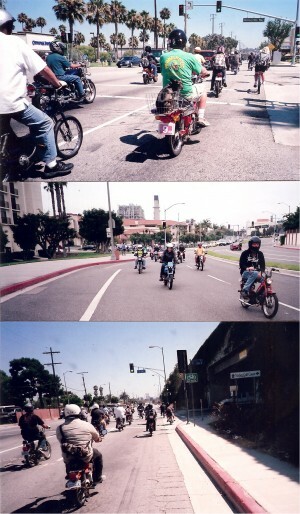 It was a great ride from San Pedro to Redondo Beach and back. Everyone got to see Shaun run out of gas while leading the group. How funny that was seeing him pedalling about half a block, while the group stayed behind, at 10mph, confused. We parked in front of Ruby’s Diner, where about half of the people ate while watching sailboats and wind surfers at the mouth of King Harbor. Many others walked out on the horseshoe shaped pier, where there are many restaurants, almost all with seafood. After lunch, some Redondo Beach Police motorcycle officers were admiring our bikes and chatting. We all made it back OK without any problems. Horseshoe Pier and King Harbor are Redondo Beach’s biggest attractions. Lots of shops, restaurants, fishing, boating, harbor tours, and of course sand and surf. We went there. It was fun. 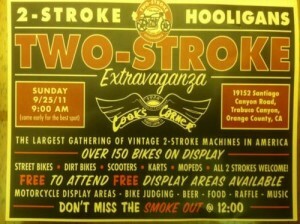 Ride 88 was to the annual Two Stroke Extravaganza. About 38 hooligans rode their two-stroke bug repellant foggers from the Orange Metrolink Station parking lot, around and around the Orange Circle, east on Chapman Ave which turns into Santiago Canyon Road which goes all the way there. In just a few miles from the historic Sunkist citrus distribution center, you’re outside the city in the foothills of the Santa Ana mountains. Curve around sandstone formations and through groves of trees until you get to Cooks Corner, at Trabuco Canyon Rd. 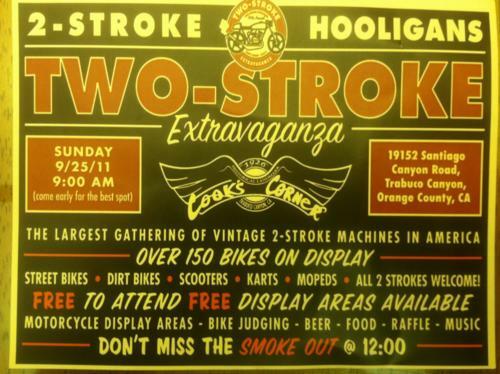 That is “Orange County’s Rock Store”, where motorcycles like to ride to on weekends. 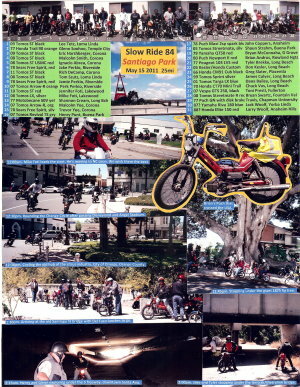 (The Los Angeles County motorcycle historic hangout in Cornell is a river rock building on Mulholland Hwy near Malibu). A variety of over 200 bikes, quads, karts, and oddball things took an hour to just walk through. 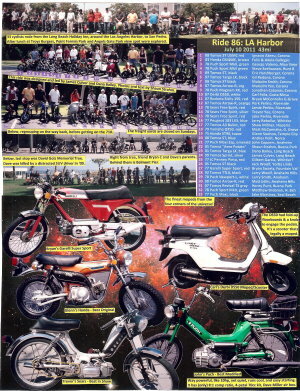 Various categories were judged. Best Moped was this wild Motobecane, too crazy to explain. 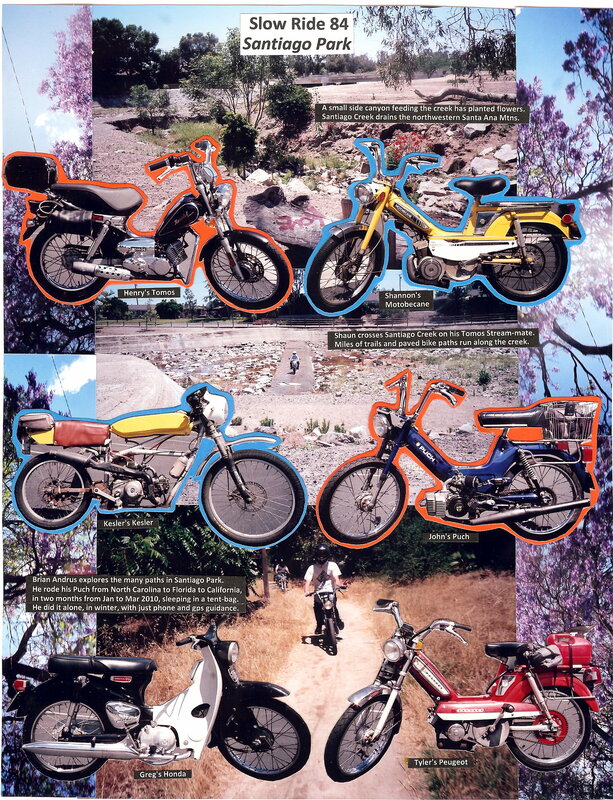 There are many pictures in Tumblr of this Myrons Ride and Two Stroke Extravaganza event. To see them click this and then scroll down. Sweet dreams! Wrrraaaeeeing, da dang dang dang! 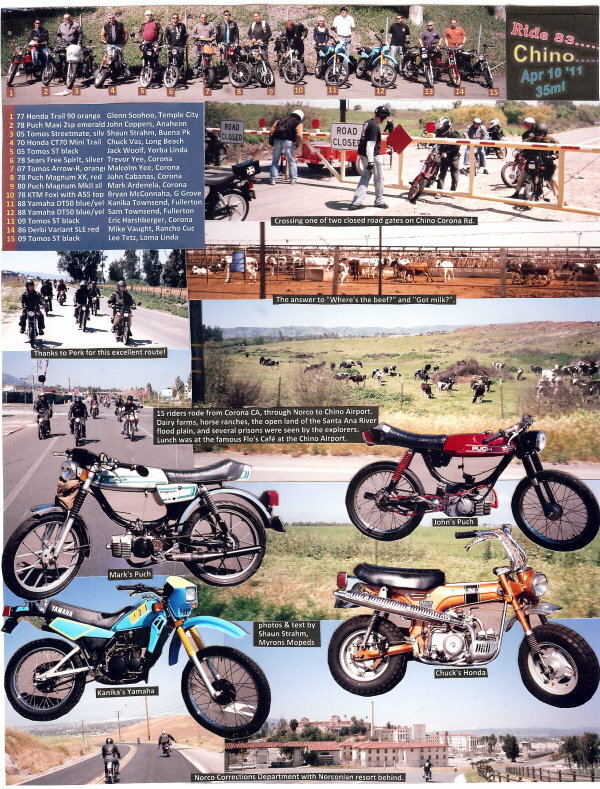 Last Sunday Oct 16 was Ride 89, Fullerton to Diamond Bar. About 35 riders attended the slow parade. First we looped twice around the old one-lane path within Hillcrest Park. Then we passed through Brea and the Whittier fault zone, where the Brea Oil Fields lie. Out of the city we motored for a few miles of scrub oak spotted pasture pleasure. In Diamond Bar we stopped for lunch in the shopping center. It was simple. Some old familiar faces made a surprise appearance. Richard drove down from San Jose. Patrick also made it a reunion ride. We love you, man. 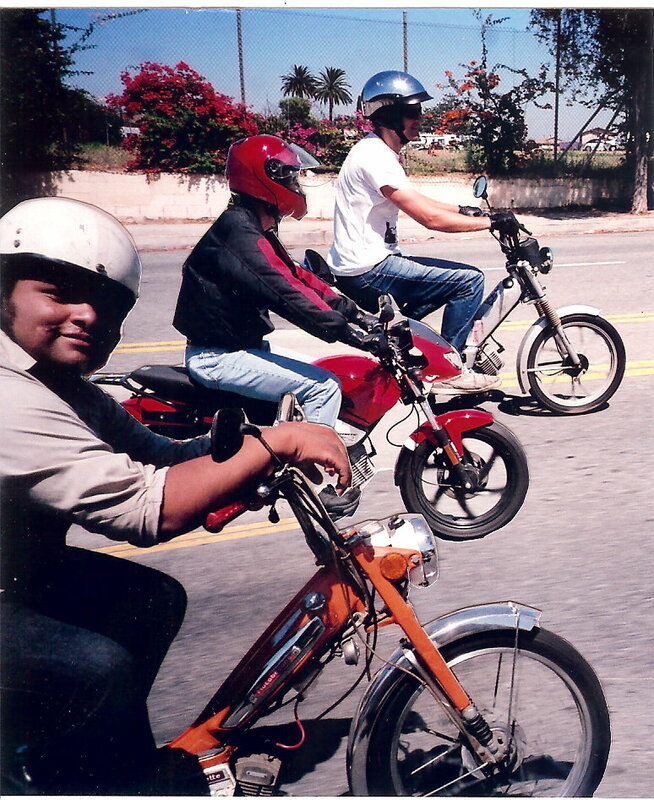 Before the ride, Shaun got to ride Buster’s 35 mph 1914 Yale 1-speed moped in the parking lot. 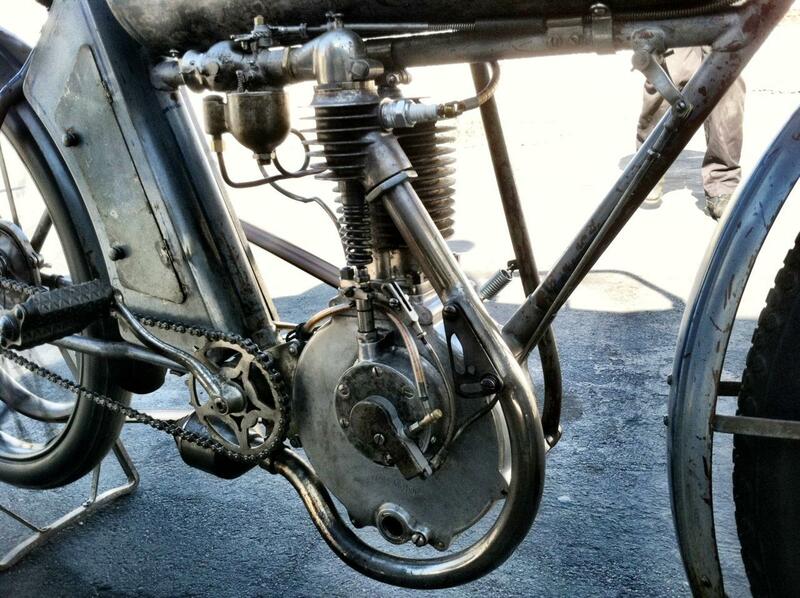 Here is a hi-res close up of the pedal-start side-valve engine that sounds like a choo choo. That’s “great-great-grampa’s moped”. Original paint and finish. Click to enlarge to full glory. What a well preserved piece of American motorcycling history! 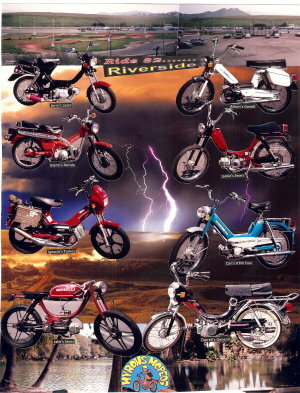 You are currently browsing the archives for the 2011 Rides category.